49 participants from various law enforcement agencies have successfully completed a Supervisors and Investigators Training Course and an investigative interviewing and statement taking course, with a view to improving the performance of duties and delivering enhanced service to the citizens and residents they protect and serve. 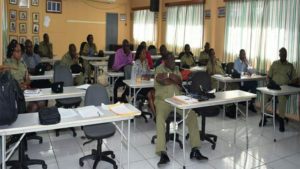 The training courses, which took place over the past few weeks, had a broad spectrum of participants including police officers, Customs and Excise and other sister agencies. At a combined closing ceremony Tuesday, Acting Commissioner of Police Hilroy Brandy stressed the importance of the training in the critical areas of supervision, and effective interviewing. “Investigative [interviewing] training provides Constables and Officers with the key skills needed to undertake, conduct and conclude a successful investigation. A good investigator must primarily be a good listener and understand body language. Through your training, consider now how best to use the skills learned and to convert the truth, conduct solid interviews, differentiate between facts and opinions, handle difficult and evasive witnesses as well as gather information. Corporal Vivion Caesar attached to the Violent Crimes Unit, gave a participant perspective of the two week supervisory and leadership courses facilitated by Mr. Darby Allen from the UK. Senior customs officer in charge of the Customs Investigation Unit Mr. Elmo Martinez gave an overview of the training on conducting investigative interviews. “We gained pertinent knowledge from vital topics such as the seven principles of of investigative interviewing, witness identification, among other topics. The importance of planning and preparation for investigative interviews was elaborated. Techniques to engage and develop rapport with witnesses and suspects also came to light the importance of allowing suspects and witnesses to give an account of what occurred while an investigator identifies topic for probing was given special attention by Mr. Allen. 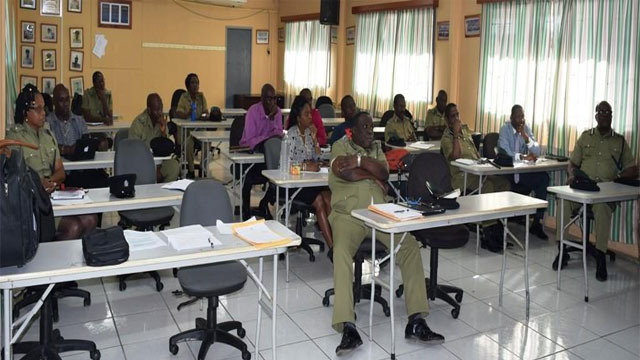 Acting Commissioner Brandy expressed satisfaction with the level of training undergone by the officers which is necessary for realizing the objectives that have been set according to the Six-Point Plan and the Police Strategic Service Plan.